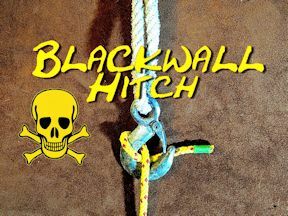 When I first came across the Blackwall Hitch, I really wondered if this particular hitch could actually do a task? First of all I tied the Blackwall around a hook and just tried to pull it apart with both hands. The Blackwall Hitch remained locked fast. I then thought that maybe I could overcome it with additional weight. 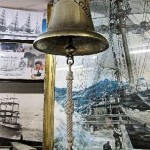 So off I trotted into the back garden and slung my hook over my steel girder that holds my ships bell. 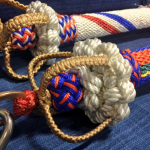 Once again I tied the single Blackwall Hitch around the hook and then swung off the rope. 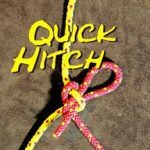 I was amazed that such a simple hitch could actually hold the weight of a fat knacker like me! Well having done my limited tests as detailed above, I can see why this hitch was used to attach loads to a crane hook. 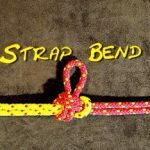 The Blackwall Hitch is just so easy to tie and then when the lift is complete, the hitch almost falls off the hook. 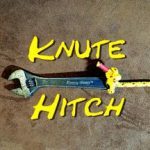 I would say that due to the fact that once the load is off the hitch, this is what can make using the hitch a possible accident waiting to happen! 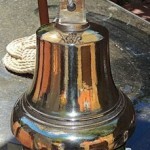 If you are going to use the Blackwall Hitch, I would seek advice prior to using it.